Wow! I can't believe it's already been 6 months since I stopped making trash and using plastic! Living zero waste has become second nature to me, and I'm profoundly grateful that I'm able to live this lifestyle. I've been successful at this way of being in the world because I believe in myself, I have an abundance of resources available (package free produce, bulk, etc..), and my friends, family, and community show me such kindness and support. By living a zero-waste lifestyle, I divert approximately 90% of my trash from the landfill. The 10% of trash that I generate includes the contents in my jar, any garbage that restaurants and cafe's produce to make some of my meals and coffee, toilet paper, tattoo trash, any garbage from packaged bulk foods before they're emptied into the bulk bins, and the waxy boxes that produce arrives in before it's stocked on the floor. I have also greatly reduced my recycling and compost throughout the last 6 months. So without further ado....Please allow me to introduce the following bits of garbage that live in my jar. Meet the infamous produce sticker and tie combo. I was making a dish, and suffice it to say I HAD to have basil. To my extreme disappointment it was bundled in that bit of plastic. That was a one time deal--the tag takes up too much space in the jar! Produce stickers are hard to avoid in grocery stores but not at the farmers market. I now present to you the devious silica packet and vitamin bottle seal. So unfortunate. They show up when you least expect it. I once bought a pair of bamboo underwear that came in recyclable box, and I was feeling great about this sustainable purchase. As I opened the box I was startled when a little silica packet dropped to the floor. Lesson learned--no more boxed underwear. There are however ways in which I can continue to use the silica packets while I've got them. Meet the newest addition to the jar--lenses from my glasses. Recently my vision got worse, which meant new lenses, leaving me with the old ones. 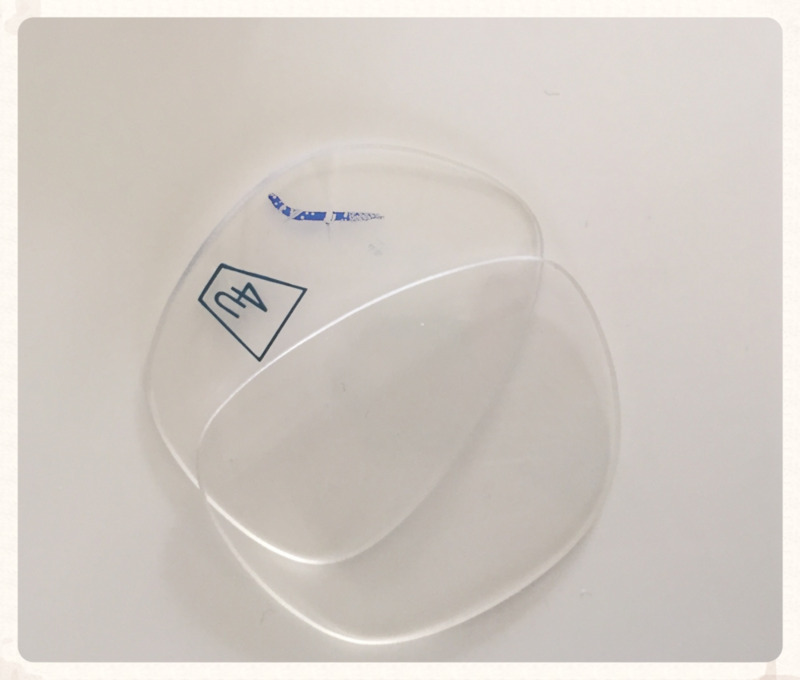 I learned that vision lenses are no longer made from glass but out of optical plastics. Great news! If you have any old glasses, it's possible to donate them to children in developing countries with a similar prescription! Say hello to the inescapable plastic bit that's used to attach price tags to a whole bunch of stuff. I shop second hand (not for delicates of course), so for the most part I'm able to avoid price tags on clothes. Other items are much more difficult-- like when I purchased my flour sack towels, the price tag was attached by a thin strand of plastic. The bread bag tie I found on a thorough sweep of the house--it's pre-zero-waste historic. We sometimes get a DVD in the mail from Netflix. In order to send it back, there's a little plastic strip on the mailer that must be removed to seal that baby up. It's trash and does not recycle-- thus it goes in the jar. Thankfully we are really horrible about returning our DVDs, so that trash has been kept to a minimal! In the photo, there's also barcode stickers from purchased glassware. At last I introduce to you the first piece of trash that I placed in the jar. I thought I had used up all of my packaged food before quitting trash cold turkey in August. Then I got sick and found a vitamin C packet. Damn that stuff is delicious! Fruit and bell peppers (they have more vitamin C than oranges!) are far better though, so no, I don't feel deprived from not drinking vitamin C packets (in case you were wondering). Keeping my garbage in a jar helps me to see and learn from my trash footprint so that I can work towards reducing it even more.